Over 2,000 candidates are in the fray for 199 assembly seats in Rajasthan, where polling Friday will determine whether the BJP bucks anti-incumbency and an increasingly aggressive opposition to return to power. Votes will be cast at 51,687 polling booths, 259 of them managed exclusively by women officials and security personnel. It is a seen as a straight fight between the Bharatiya Janata Party and the Congress for about 130 seats. In other constituencies, groups like the Bahujan Samaj Party and rebels who are contesting against official party candidates may queer the pitch. Vasundhara Raje hopes to return as the state's chief minister. If the Congress wins, it is expected to pick between former chief minister Ashok Gehlot and state party president Sachin Pilot for the top post in the state. 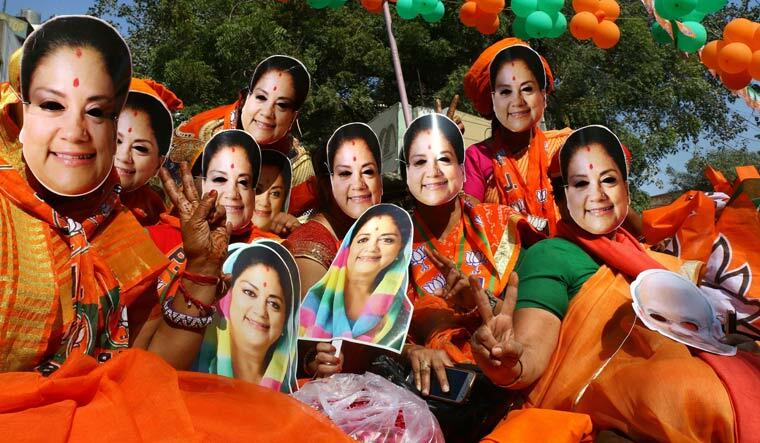 Raje is contesting from Jhalrapatan constituency, considered her bastion. This time she face BJP veteran Jaswant Singh's son Manvendra Singh who has defected to the Congress, complaining that his old party had hurt the pride of the Rajputs by ignoring his father in the last Lok Sabha election. In Tonk, Sachin Pilot and Rajasthan Transport Minister and BJP candidate Yoonus Khan are face to face. Khan is the only Muslim candidate fielded by his party. Ashok Gehlot is fighting for the Sardarpura seat. The polling caps a hard-fought campaign between the Congress and the Bharatiya Janata Party. Prime Minister Narendra Modi addressed 12 major rallies and Congress president Rahul Gandhi nine in the state. Both sides fielded their top leaders in the campaign. Telangana and Rajasthan are the last states to go to the polls in the current round of assembly elections, which also covered Madhya Pradesh, Chhattisgarh and Mizoram. The counting for all states is on December 11. Election officials said 2,274 candidates are contesting in Rajasthan which has 4.74 crore registered voters. About 1.44 lakh security personnel have been deployed for polling day. The state assembly has 200 seats, but election in Alwar district's Ramgarh constituency has been put off due to the death of Bahujan Samaj Party candidate Laxman Singh. More than two lakh electronic voting machines (EVMs) and verifiable paper audit trail (VVPAT) machines will be used in the elections, chief electoral officer Anand Kumar said Thursday. He said it was for the first time that VVPAT machines are being used in Rajasthan. The BJP has fielded candidates for all 199 seats and the Congress for 194. For the five remaining seats, the Congress is in alliance with other parties. The BSP fielded 190 candidates, the CPI (M) 28 and CPI 16. Of the total 4,74, 37,761 registered voters, 2.27 crore are women and 20,20,156 are registered as first-time voters, Kumar told reporters. In the run-up to the polling, the Election Commission received 3,784 complaints related to violation of code of conduct. Of them, 3,098 were found true, he said. He said 13,182 booths are being called critical. Micro observers will be deployed at 4,982 booths, videographers at 3,948 and there will be webcasting from 3,138. As many as 4,146 vulnerable villages have been identified. Central Reserve Police Force personnel will be stationed at 7,791 booths. Nearly Rs 15 crore has been seized as unaccounted cash during the campaign period. Liquor worth Rs 25 crore, drugs worth Rs 7.48 crore, gold and silver worth Rs 6.88 crore and vehicles worth Rs 11.89 crore were also seized. Over 4,000 illegal arms were seized after the model code of conduct came into force last month. Rajasthan Director General of Police O P Galhotra said foolproof security arrangements are in place.